Goreme is the main hub of Cappadocia, a region in Turkey. Strange rock formations and underground cities make this an alluring stop for any visitor to Turkey. Göreme National Park is one of the most beautiful naturally formed sights in Turkey. Two of the inactive volcanoes surrounding the region used to be active in earlier geological periods and with the eruption of the volcanoes the whole region was covered with tufa. Over the centuries with the rain and the wind several fairy chimneys, caves and rock formations were formed. Goreme National Park is composed of caves that have 12 churches, a dining room and a kitchen. It is a religious site used by Roman Christians in order to hide themselves. In fact some say that the word Goreme derived from Turkish word gorme which means "don't see". It's a Unesco World Heritage Site. The Underground City of Kaymakli has nine levels beneath the ground with its ingenious exhaust systems, food storage places and ventilation spots. These were made by the people as a means of defence. When the levels go beneath the ground, they narrow, which is how the people protected themselves from mass attack, since the narrowness made it extremely difficult for attackers to get in with large numbers. That said, it's not the nicest place to visit if you're claustrophobic! The multitude of different passages were meant to hoodwink the enemy. The place also has a well and numerous ventilation ducts, some of which are hidden to the naked eye while others can be seen. The kitchen and the storage chambers are also worth looking at. Fairy Chimney Rock Formations: Houses were carved out of these rock formations. Ballooning is a popular but expensive way to see Capadoccia is by balloon. The Historical Museum is definitely worth a visit. It has a lot of fairy mountains which have been used by the Christians, as well as quite a few frescoes, though some of these had been removed. The Nightlife is laid back with a few clubs but not a lot of people, though Pacha Bar is a decent place to visit. Most of the places usually close by 8 pm. In the evening, the best thing you can do is watch the sunset from the hills where one can also view the colourful background of the land below. * The Pigeon Valley is an amazing place where one can see a lot of pigeons. The valley also has red coloured hills which at the time of sunset look extra-terrestrial. There is also a craftsmen workshop, where you can buy souvenirs. Please note you can also bargain here - start with a third of what they ask and you could get something for an excellent price. The Rose Valley and surroundings should be visited in the evening partly because of the unrelenting sun at noon time and also because the best views can be had in the evening, as the valley's red hills change colour at sunset. A great way of getting around Goreme is on mountain bike and the trip to Rose Valley is achievable for most riders. There are some technically difficult tracks that will suit if you want a challenge but you should definitely consider a one day mountain bike whie in Goreme. A good tip though is to do your research and bargain hard. The best methos we found was to do the bargaining for the bike(s) the day before you intend to hire. This is when the best deals happen as you are not as desperate to get going and you can negotiate in a more relaxed frame of mind. Quality and prices vary so shop around and bargain hard. Avanos is a city where there are many locals. You can a lot of carpet weavers and workshops, as well as restaurants. Goreme can be easily travelled on foot although for going to Avanos and other far areas one needs to take a taxi or better still rent a bike or car. However, many of the roads are poor and potholed, so be sure to drive slowly. Most people do one of two bus tours around Goreme. The tours are offerred by all hotels and guesthouses and are listed as the Red and ther Green Tour. Prices vary for the one day tours so shop around for the best deal. The Red tour takes in the Fairy Chimneus while the Green one heads South to the Valley region. Both are very good though the Green tour is the most popular. 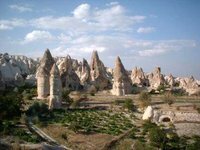 We have a comprehensive list of accommodation in Goreme searchable right here on Travellerspoint. You can use our map to quickly compare budget, mid-range or top of the range accommodation in Goreme and areas nearby. This is version 25. Last edited at 3:02 on Aug 2, 17 by sleepBot. 6 articles link to this page.